Kitchen remodeling is a big project. A full kitchen remodel has a national median cost of about $60,000, according to the 2015 Remodeling Impact Report from the National Association of Realtors. So if your kitchen is drab, unappealing, or just in need of a change, it’s important that you do your research before diving into such a serious renovation project. Practicality and durability – First and foremost, you want to choose a flooring material that’s practical and durable. This ensures a long life for your newly remodeled kitchen. If you expect heavy foot traffic, stone and tile are always practical choices. Ceramic tile is another durable option that offers a huge variety of colors and styles. Aesthetics – It’s also very important to choose a flooring option that matches the rest of your kitchen’s features. There are all kinds of avenues you could follow to achieve this goal — you may even want to consult a professional design consultant to help you. If you’re seeking a universally agreeable material, hardwood flooring is a timeless option, matching well with just about any style scheme and creating a warm and inviting atmosphere. 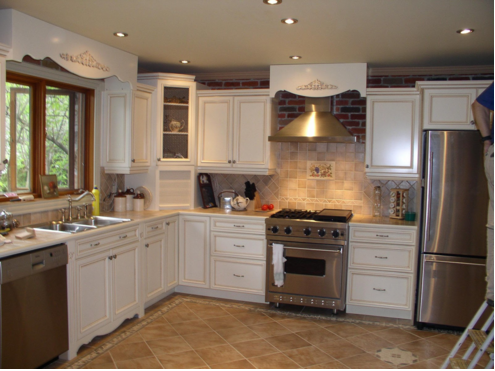 Your budget – Kitchen remodeling projects are expensive, but you can tweak certain features if you have a smaller budget. Vinyl flooring and other resilient flooring options are durable, reliable options for a kitchen floor — and won’t break the bank. When you decide to dive into a kitchen remodeling project, it’s important to consider all of these elements. You want to find the right intersection of practicality, aesthetics, and cost-effectiveness in order to get the most out of your remodeling project. A consultation with an employee at our Conshohocken flooring store can be a valuable asset during this process! Call Our Conshohocken Flooring Store Today! If you’d like some expert assistance completing the flooring for your kitchen remodeling project, the team at Norman Carpet One can help. We offer a wide range of flooring options for all rooms of your home, often at highly discounted rates. Contact us today for an in-home consultation. We look forward to hearing from you!